My PhD supervisor once told me that everyone doing newspaper analysis starts by writing code to read in files from the ‘LexisNexis’ newspaper archive. However, while I do recommend this exercise, not everyone has the time. 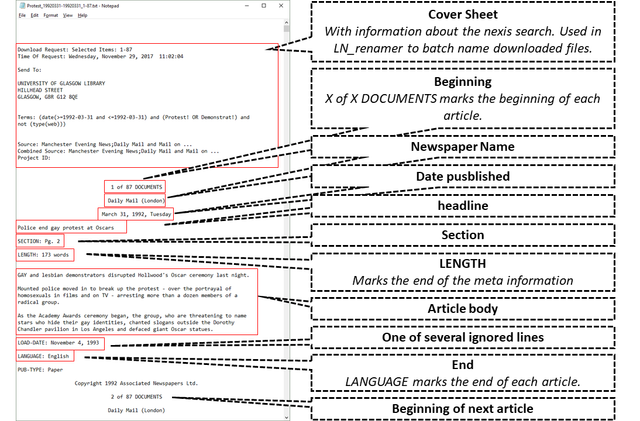 This package provides functions to read in TXT files downloaded from ‘LexisNexis’ and comes with a few other features I think come in handy while working with data from the popular newspaper archive. Did you experience any problems, have questions or an idea about a great new feature? Then please don’t hesitate to file an issue report.